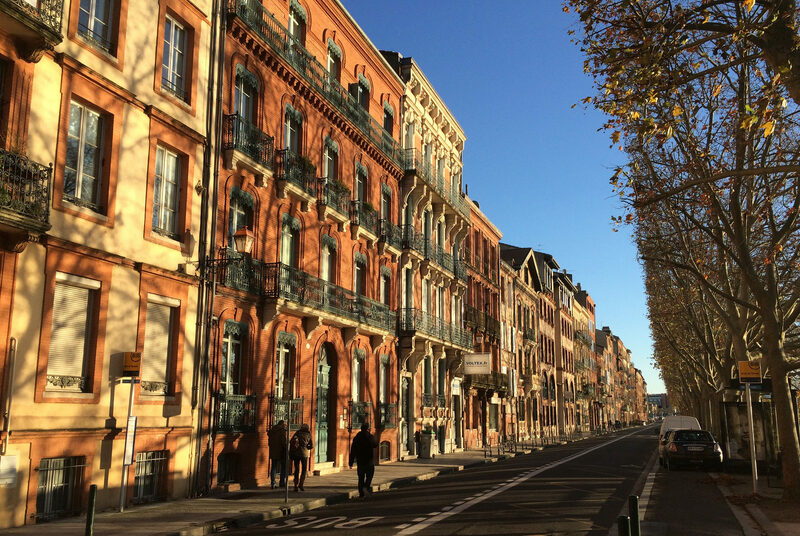 Toulouse is charming, easy to walk around, aesthetically beautiful, and without doubt the liveliest and most laid-back city in south west France. According to Campus France Toulouse is the most popular destination for French and international students wanting to study in France. La Ville Rose, so called because the city is built out of red brick and glows beautifully when the sun sets, is a young, friendly, warm, dynamic, yet laid back city of almost 500,000 inhabitants and is just an hour or two by car or train to some of the best scenery France has to offer. The fastest growing city in France, yet untouched by mass tourism, it looks across the Pyrenees to Spain for its inspiration, turning its back on “polished Paris” and “bourgeois Bordeaux”. If you love France but prefer a less uptight attitude, this could be the place for you! And if you are under 30, there is no question about it! 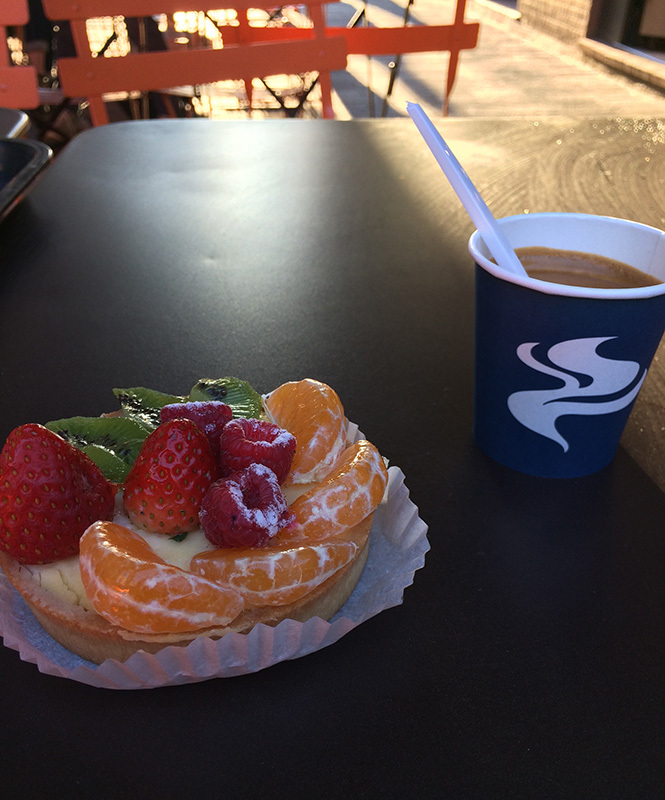 Have a look at this Toulouse guide. Toulouse = Italy + Pyrennees + Airbus? It is also the modern combined with the old that makes Toulouse a fun place to live. The historic centre has a feel of Florence or Siena about it, whilst the Airbus industry here means that the city has an international feel, and is very well connected by low-cost European flights. In many local restaurants, business folk elbow in alonside students (there are over 100,000 of them in Toulouse) and aerospace engineers! Young and old play petanque outside the TEFL Toulouse Training Centre as the sun sets, and summer days see hundreds picnicking on the banks of the Garonne river or pottering around on barges on the Canal du Midi. The weather is very hot in summer (up to 35 degrees celsius) very cold in winter (down to 0 degrees) but nearly always dry and sunny. Friday evenings in winter see an exodus from the city on trains, heading south for a cosy weekend in the Pyrenees, about 70 miles away. Unlike Mediterranean cities (Nice, Montpellier, Cannes, Monaco…) Toulouse is not a tourist destination or a holiday destination for Parisians, and small enough to walk fully across the centre in 30 minutes. Everyone seems to love English speakers here, you’ll get talked to a lot at bus stops! Its size is enough to inject culture and nightlife to the city. 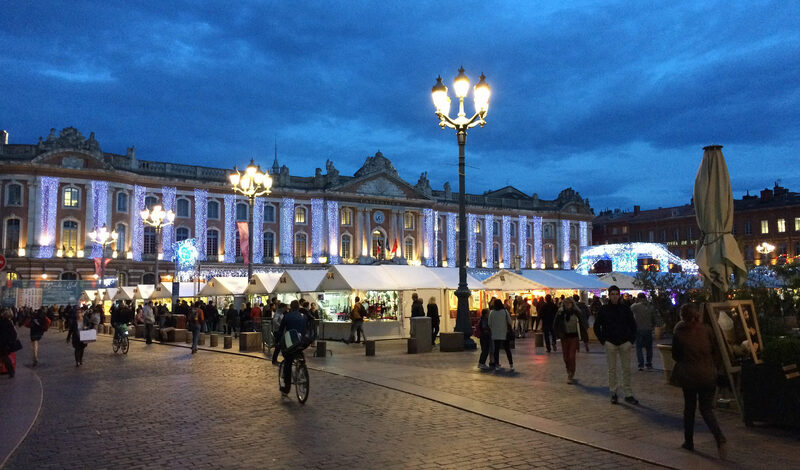 There is always something unexpected going on in the main square – the place Capitole. Live music, particularly jazz, theatre and cinema abound, every day and night of the week, and there are plenty of activities for children. Walk everywhere, or rent a bike! Perhaps the best reason of all to be in Toulouse though, is where it is in Europe. Just an hour or two away by train or car in any direction is wonderful scenery and a selection of very different cultures. 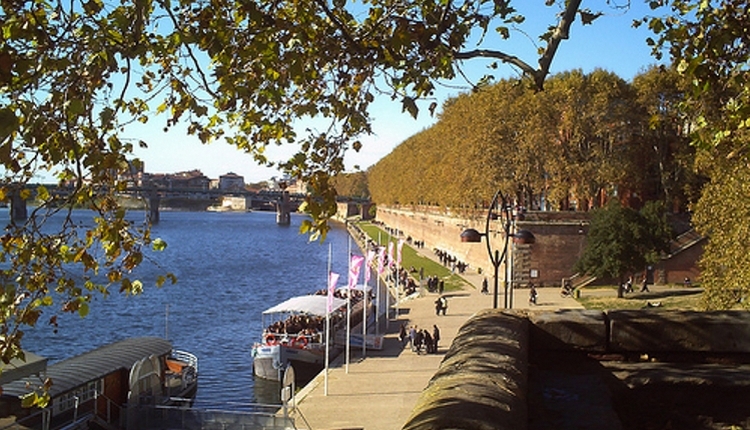 Albi the “cute version of Toulouse” and birthplace of painter Toulouse-Lautrec is the number one daytrip in our opinion, with the newly cleaned up “Paris by the sea” Bordeaux the best weekend trip from Toulouse. North is the Lot valley, the least populated region in France, with endless rolling hills, twisting rivers and vineyards. A 45 minute train ride east of Toulouse takes you to the astonishing Unesco Heritige site of Carcassonne, with its incredible 12th century walled castle “cité” . The Canal du Midi is another Unesco Heritage site (which in fact starts in Bordeaux, runs through Toulouse and then Carcassonne before joining the Mediterrenean) can take you along this whole route by barge (or bicycle) and many locals and holidaymakers spend the summers doing just that. Narbonne is another gorgeous town not far from where the canal meets the Med. South, The Pyrenees mountains, just over an hour away by hire car is a paradise for skiers, walkers, climbers and cyclists, then Spain on the other side. The only problem is choosing where to go for your weekends away! Three hours’ drive or train west brings you to the Atlantic coast: Biarritz, St Jean de Luz and San Sebastian, all of which are superb beach destinations with enviable standards of living. 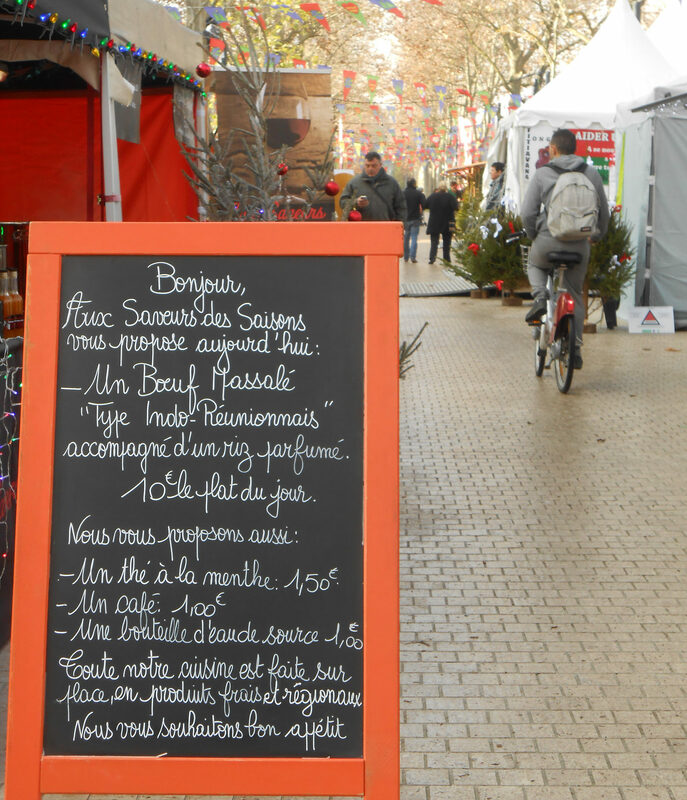 Add to this some of the best food and restaurants in France, and the temptation to live in Toulouse is hard to withstand! 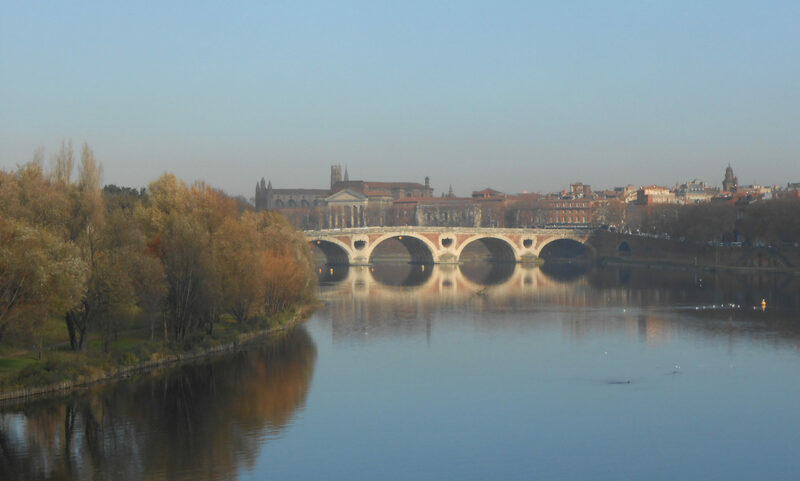 Hopefully you can now see why we recommend that even short term trainees stay in Toulouse for at least 3 weeks after their TEFL course. There are excellent job opportunities for teaching English locally around Toulouse (and nationally – several of our ex-trainees have set up their own schools in France over the past year). Suddenly, everyone in France seems to want to learn English! Plenty of teaching work is available in France after the TEFL course when one considers the many language schools in Toulouse and also the opportunities for freelance teaching. After decades of reluctance to learn English in France, it seems that every French person is looking for an English teacher now, and we show you how to set up as an auto entrepreneur (freelancer) in France. In a nutshell there are plenty of jobs in France for TEFL teachers. There is nothing obliging you to teach English in Toulouse after the TEFL Toulouse course. There are TEFL jobs in Bordeaux, in Lyon, in Montpellier, in Marseille, in Nantes. Getting trained in Toulouse will give you an excellent start to your teaching career in France, or a springboard to teach English around the world. 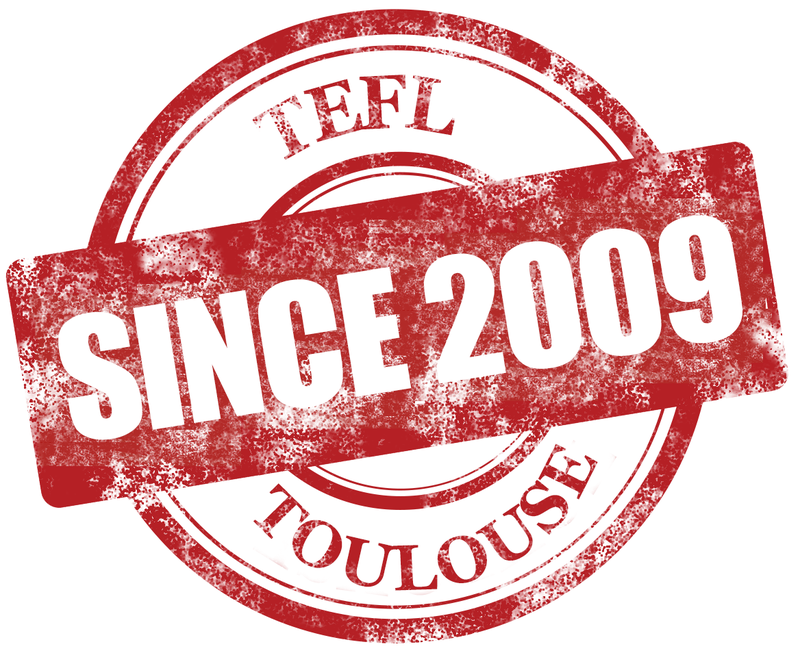 Want to find out more about our TEFL course in Toulouse? Get in touch! August 5 - August 30th 1800 euros 10th anniversary course, 1 free place offered!